Diwali is known as the ‘festival of lights’ that symbolize the victory of good over evil. The festival celebrated by every Indian in all over the world with zest and zeal. On this day people decorate their houses and illuminates with earthen lamps and candles many also use electric and LED bulbs to decorate their house. Every house, buildings, offices and temples can be seen decorated and illuminated with lights. Worshipping goddess Laxmi and lord Ganesha is the ritual and custom of this festival. Goddess Laxmi showers wealth and prosperity and lord Ganesha will shower knowledge and wisdom in our life. There is one more ritual is very popular and that is buying expensive metals like gold, silver or diamond. People also waits for this sacred festival to buy electronic goods also because of huge discounts they get from retailers and also it is considered as good omen like bringing Laxmi at home. 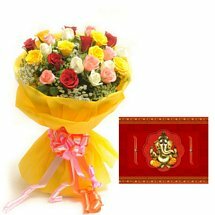 Even people exchange gifts with their loved ones and relatives on this auspicious day to share love, joy and happiness. And those who stay far from their relatives they use to send diwali gifts to India online or abroad as well. When it comes to gifting someone then everyone wants to pick the best and unique gift. The best way to pick the best gift for someone is to choose a gift according to the person’s age and relationship you share with the recipient. And premium relationship always deserves a premium gifts. So, on this auspicious occasion of Diwali you must buy premium gifts online to delight your dear ones. The shine and luster of gold and silver always attracts everyone and getting a gift of these precious metals will bring million dollars smile on their face. Anything that is made of or coated with gold and silver metal is known as premium gifts. Showpieces: Classy showpieces are always people’s first choice when it comes to decorate their home. And it is the custom and tradition of Diwali festival to decorate our houses. So, you can pick silver plated showpieces for your relatives as Diwali gifts which they can use as home décor to embellish their home on Diwali festival. Kitchenware: Premium kitchenware like silver plated bowls, gold plated bowls, silver and gold plated tea cups and saucer set, etc. will be the best to gift someone on Diwali. This is the essential of every home especially in festival time when need to serve desserts and foods to guests. So, you can buy silver plated kitchenware online for your dear ones and send as Diwali gifts to India online. Idols: Laxmi Ganesha idols or other deity’s idols are the popular gifts on Diwali so why not make it even more precious by picking premium idols. You can pick gold plated Laxmi Ganesha idols, silver plated Laxmi Ganesha idols, etc. on Diwali which will bring peace, happiness and prosperity in recipient’s life. Pooja Thali Set: On any Indian festival, Pooja thali is a must. Whether for daily worshipping or on festive occasions we use Pooja thali so, on the auspicious occasion of Diwali you can send silver or gold plated Pooja thali to India online as diwali gifts for your dear ones. Whatever is your requirement regarding premium Diwali gifts will be fulfilled here. We have astonishing collections of premium gifts that you can opt for your relatives and family on Diwali festival. Silver plated Laxmi Ganesha idol, Gold plated Laxmi Ganesha idol, Silver plated Ganesha idol in case, Silver plated Krishna idol, Silver plated Pooja thali set, Silver plated ice cream bowl, Silver plated Radhe Krishna idol, Gold plated playing cards, Silver plated bowls, Silver and gold plated tea cups and saucer set, Silver plated wine set, etc. are some of our best collections. You can browse our site to pick the best premium gift for your dear ones and give a wonderful surprise. 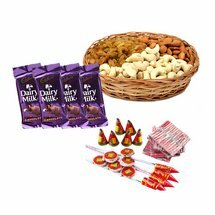 Pick the best premium gift and teem with delectable sweets, chocolates or dryfruits hampers to make it even more special gift for the recipient. Sharing sugary delights with relatives and family on festive days is considered to be good omen. 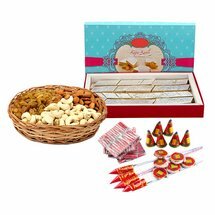 There is no celebration in India that is completed without sweets and considering that we have brought the delicious sweets hampers for you all. Here you will get variant varieties of sweets like Rasgulla, Kaju Katli, Besan Laddu, Kaju Roll, Kaju Barfi, Gulab Jamun, Rasbhari, Soan cake, Soan Papdi, Rajbhog and much more. Staying far from family on this auspicious festival is saddening and we totally understand your feelings and pain of not celebrating the festival together. But you can still bring million dollars smile on your beloveds’ face and be the part of their celebration even staying miles away by sending diwali gifts to India online through our gifting portal. 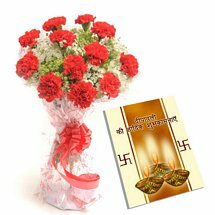 We have express Diwali gifts delivery in all over India. 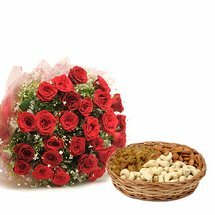 Whether you need to send Diwali gifts to Delhi, Mumbai, Pune, Kolkata, Bangalore, Chennai, Hyderabad, Dehradun, Bhopal, Assam, Chandigarh, Ahmedabad, Gwalior, Indore and any other cities of India you can send it easily through our portal.